The 'Skintensive' Hero from Comvita. I've been suffering from perioral dermatitis now for a good few years. In recent months, however, I haven't been able to remember what my skin is like without this irritating enemy taking over my face. Sure, I could go to the doctors and be prescribed yet another round of antibiotics for my skin issues, but, I've learnt antibiotics are only ever a very temporary cure for my acne and this annoying re-occurring itchy, bumpy rash. It always comes right back. 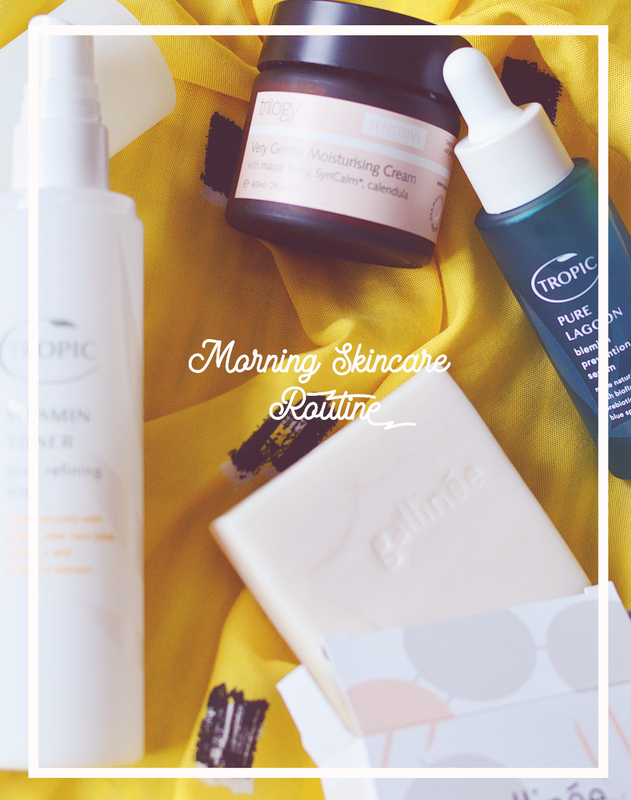 Instead, I've been researching, trialing and looking into other methods for keeping the problem at bay - I know I've mentioned some of them before on the blog, and I promise eventually I'll do a roundup of those that really work for me, but for now we have just one product that's doing a stellar job. 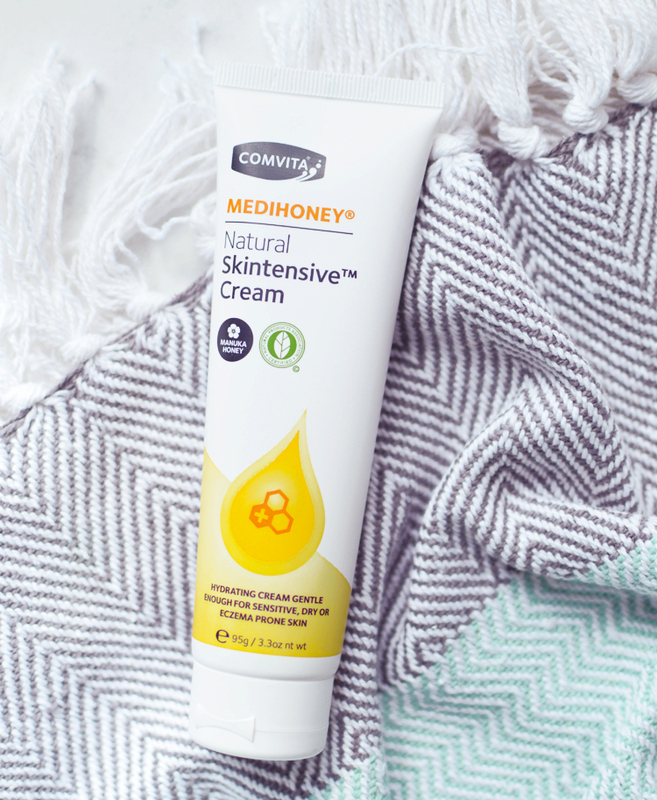 I've been using the Comvita Medihoney Natural Skintensive Cream (£8.99) now for a couple of weeks and I really feel like it's helped keep the inflammation down during a time of stress and a poor skincare routine thanks to moving house. Perioral Dermatitis is particularly ugly thanks to the little red bumps and constant flaking of the skin, I can't use any of my normal spot treatments as it's not acne, and I can't use nourishing oils as they would exacerbate the situation even more, so a lightweight yet super hydrating cream is just what the doctor ordered. 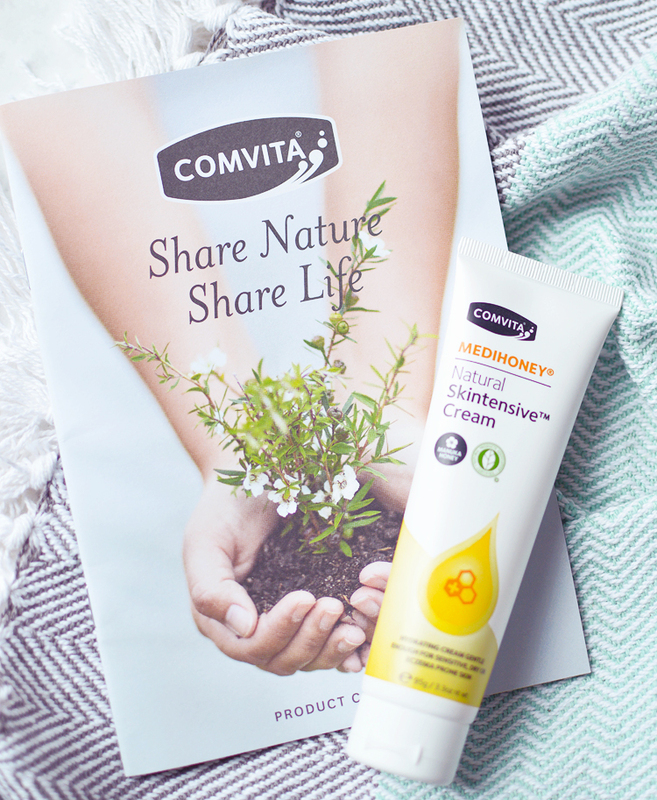 The Comvita Skintensive Cream is PH balanced, completely fragrance-free and doesn't use any phenoxyethanol (which is a preservative I've since learnt sends my PD crazy). Comvita use medical grade 'Medihoney' Manuka honey which is clinically proven to support wound healing, soothe skin and helps retain moisture. The cream itself is very lightweight and has a thin, almost runny texture that spreads easily over skin and feels immediately hydrating and soothing. Despite the texture, the cream's first five ingredients are water, honey, coconut oil, olive oil and cupuacu butter, so it is still rich and soothing for dry, scaly skin. This cream is specifically created to soothe very dry skin, so I only use it to spot treat the areas of dermatitis and don't apply it all over my face as it would likely be far too rich for my oily, acne prone skin. I tell ya, having more than one skin issue in a small area is no walk in the park. I avoid using coconut oil on the rest of my face at all costs, but in the areas of PD it works a treat which is so weird?! I have also been using the cream on any other dry patches I may have; elbows, knees and feet especially. It works a treat slathered generously over your feet with some socks on - hello super soft sandal ready toes! ... it's actually a little late for sandal weather, but who says you can't have soft feet under your winter boots? For under a tenner this cream is a total bargain, and now with the weather turning colder it's a good one to have around for emergency situations!